The majority of the electricity generated at the 1.2MWp solar scheme is used on site, with offsetting electrical consumption now the primary focus of projects. Image: Scottish Water. 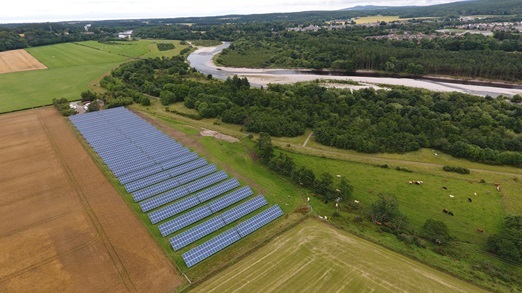 Scottish Water has said it no longer designs its solar projects around feed-in tariff revenue after successfully completing its largest solar scheme to date to power boreholes taking water from the River Spey. The 1.2MWp solar scheme developed by Scottish Water Horizons, a wholly owned subsidiary of the utility, has been split across two sites - 750kW and 450kW in size – adjacent to the borehole sites in Speyside. The £1.2 million installation - the largest investment in renewables made by Scottish Water - will offset over one fifth of the borehole sites’ electrical needs annually, with 80% of the generation to be used to take the water from the river and pump it to the nearby Badentinan water treatment works. While both systems are eligible for the feed-in tariff, project manager John Sammon explained that this was no longer the primary focus of Scottish Water’s solar projects. “Our approach for the last few years has been increasingly focussed on offsetting electrical consumption within Scottish Water sites by installing generation at the point of use, maximising self-consumption and avoiding export where possible. This works both commercially and technically, as often we are faced with grid constraints and export limitation,” he said. Whilst the feed in tariffs are still important for the business case, they no longer dictate the approach to system design. The installation, completed by contractor Absolute Solar and Wind in June, will see both sites generating a total of 1GWh of energy per annum, helping Scottish Water meet renewable energy targets while pacing on savings from its electrical consumption to consumers. This model will now be taken forward to further developments, with Scottish Water Horizon preparing to deploy “a strong pipeline” of further sites of various sizes and stages of development. Sammon added: “The PV panel scheme in Speyside is the largest we’ve undertaken to date, but it’s just one of many across Scotland that are already generating clean, renewable energy to help power our assets and keep customer bills down.